Porsche has just put the new 416 hp 2014 Panamera S E-Hybrid through some testing by independent journalists and it's not only fast, but it’s fuel-efficient. But are these fuel-mileage numbers real-world? Porsche has just put their new 2014 Panamera S E-Hybrid luxury plug-in hybrid through some real world testing and it showed some very impressive fuel-mileage numbers. And the world’s first plug-in hybrid in the luxury class is one hot sports sedan. It can achieve impressive performance numbers for the driving enthusiast and it also can achieve very good fuel-mileage. But Porsche achieved the numbers with a well-planned course for journalists to drive. 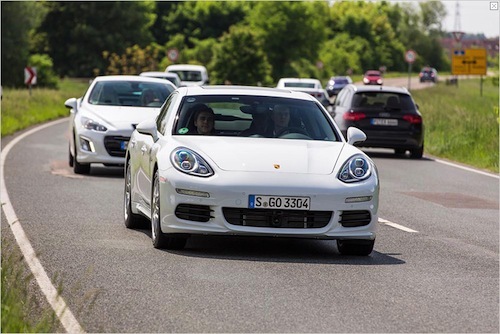 Porsche tested the new Panamera S E-Hybrid in an international press event in which 42 test drives were conducted by auto journalists. They drove four new production luxury plug-in hybrids covering a distance of over 1,200 kilometers. Just what kind of fuel-consumption did the Panamera S E-Hybrid achieve? In four unmodified Panamera S E-Hybrid production cars, each carrying three to four persons, the model consumed just 4.4 l/100 km (53.4 mpg) averaged over all drives. The top value recorded on the circuit course was a low 2.8 l/100 km. They tested the new luxury hybrid with the climate control system on and accelerating up to 230 km/h on the highway section of the route. The test circuit followed a 28.7 km course through and around the city of Hockenheim, Germany and comprised 6.5 km city driving, 9.2 km of country roads and 13 km on the German Autobahn that has no speed limits. The course allowed opportunities to systematically recharge the 9.4 kWh lithium-ion battery and is the only way these numbers are attainable. Even though Porsche had a very specific well-planned course, it’s still impressive for the performance oriented luxury sedan. The Panamera S E-Hybrid offers a combined system power of 416 hp (306 kW), and will sprint from 0-100 km/h in 5.5 seconds and has a top speed of 270 km/h (168 mph). This makes the new luxury plug-in hybrid one fast sedan. As automakers need to meet the new global fuel-mileage standards, we will see more manufacturers coming out with these hybrid models to raise the numbers for their fleet. Porsche says they also confirmed the car’s range of 36 kilometres in all-electric driving in the practice runs during the event. A fuel consumption value of 0.0 l/100 km and zero local emissions, was not only attainable in NEDC testing on a dynamometer, but also on the street. The luxury plug-in hybrid attained this value at an average speed of 54 km/h, while the average speed in NEDC testing is just 33 km/h. It will be interesting to see what the new Panamera S E-Hybrid achieves without a planned course in everyday driving. Porsche had a well planned out course for the journalists to achieve these numbers, but it still illustrates that in real-world operation, it is entirely possible to attain fuel consumption values of the same magnitude as the value determined in NEDC testing, which was 3.1 l/100 km. Will Porsche be able to find enough high-end luxury buyers who will shell out $100,000 to own the new S E-Hybrid? Look for the new 2014 Panamera S E-Hybrid to be in showrooms starting July 27, 2013.